There is no denying the power of Spanish shows for learning Spanish vocabulary and expressions. We get involved with the story and characters, and as we keep watching, we learn language. There are lots of great Spanish shows for intermediate and advanced learners. However, it is not easy to find authentic programs for beginning learners. In addition, when you’re working with young people, and need to avoid adult topics, it gets even more difficult. Unfortunately, appropriate material at an accessible level is hard to find! Buena Gente is a series of Spanish shows for learning Spanish with natural conversation. It is free on YouTube. In addition, you can find a variety of listening comprehension activities and information about teaching with the Spanish shows here on Spanish Playground. Read more about the Buena Gente video series and find free printable learning materials for Season 1: Spanish YouTube Series Buena Gente. In this season, Sandra and Alejandro are expecting their friend Mateo to arrive and stay with them. Unfortunately, they are having trouble with the house. Watch as they deal with preparations for company and their problems in clear, natural Spanish. 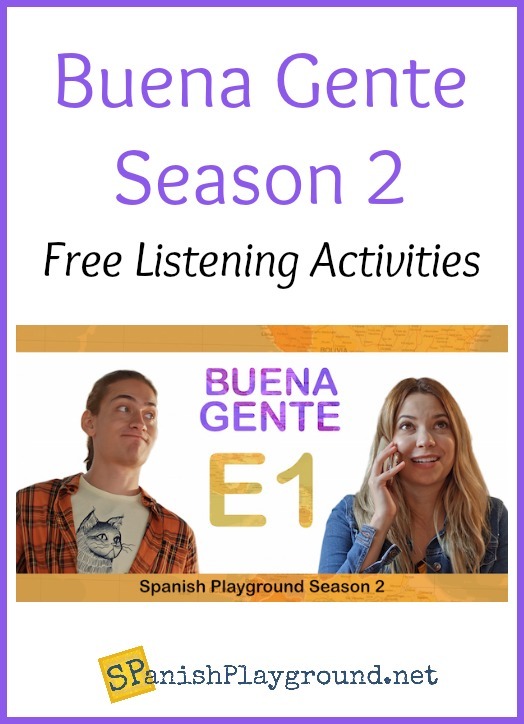 We have listening activities for all Buena Gente episodes, including pre-viewing ideas, main idea questions, sequencing activities and fill-in-the-blank while-listening activities. These materials make it easy to use the Spanish shows for learning Spanish vocabulary and common structures. We also have activities and a download of the Buena Gente theme song. See all the Spanish Video Series Buena Gente learning materials. In addition to the activities above, these activities for Episode 1 will get you started with Season 2 of Buena Gente. These activities are also included in the complete digital download of learning materials for Buena Gente Season 2 Episode 1. Before viewing, I establish the context by giving a list of key vocabulary or showing screen shots from the episode. I ask students to guess what will happen based on the words or pictures. Next, students watch the whole episode again. Then, in pairs or small groups they tell each other what they understood and share with the class. After that, we read over the questions and try to answer. Finally, we watch again to check the answers and answer additional questions. 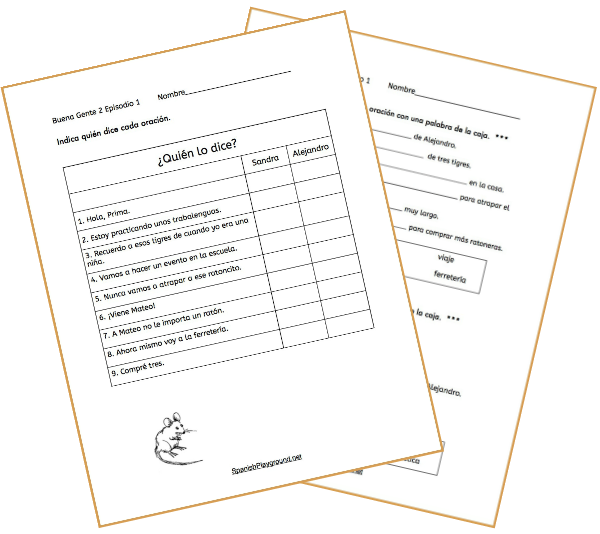 In this PDF, you’ll find a ¿Quién lo dice? chart for students to indicate which character says a sentence. There is also a complete-the-sentence activity to work with vocabulary. The complete-the-sentence activity focuses on nouns that reinforce the story, and both the ¿Quien lo dice? chart and the complete-the-sentence activity help retell the action of the episode. The second complete-the-sentence activity focuses on verbs. I’ve included two versions, so you can choose which is appropriate for your students. And, both versions have word banks. In the first version, students place the verbs into the sentences as they are, because they are conjugated or there is an auxiliary verb in the sentence. However, in the second version, students conjugate the verbs in the word bank in the present tense. Get the free listening activities for Buena Gente Season 2 Episode 1. Spanish shows are one of the easiest ways to introduce students to natural, conversational language. So, be sure to check out the Videos tab on the top menu for more Spanish programs for your language learners. Also, let us know about your favorite Spanish shows to use with beginning learners.